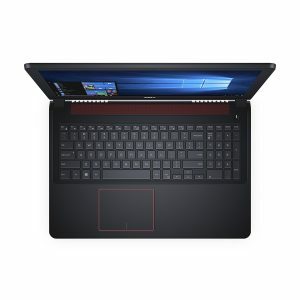 Black Dell Inspiron i5577-7359BLK-PUS is a 15.6-inch mid-range traditional gaming laptop as part of the Inspiron 5000 series, with a seventh generation Intel i7 processor and the GTX 1050 graphics card. You can get it with an i5 processor and just the 256GB SSD at a slightly cheaper price as you’ll see on the Amazon product page. The model we’re reviewing comes with the quad-core Intel i7-7700HQ processor (6MB cache) at 2.8GHz up to 3.8GHz speed with turbo boost and hyperthreading for four cores to handle eight threads in parallel, 8GB DDR4 SDRAM (1 x 8GB) at a faster 2400MHz speed and that can be expanded up to 32GB if you will need more than 32GB, a hybrid drive of 128GB Solid State Drive and a 1TB standard HDD hard drive (it has an M.2 drive (SATA or PCIe/NVMe) and a 2.5-inch drive (SATA)) at 5400rpm rotating speed and English Windows 10 64-bit operating system. 15.6 inch LED-backlit Full HD display has the 1920 x 1080 pixel resolution and IPS panel with 178-degree viewing angles. It looks rather stylish and beautiful with the brushed hairline palm rest, weighs 5.7 pounds- heavy for a 15.6-inch laptop and measures 0.43 x 15.7 x 0.99 inches, so it is not so portable because of having an SATA hard drive, all the power, and a Full HD display panel. The keyboard is bottom-mount and WASD red-backlit and has comfy keys to type with and includes 10-key numeric pad and a responsive trackpad. 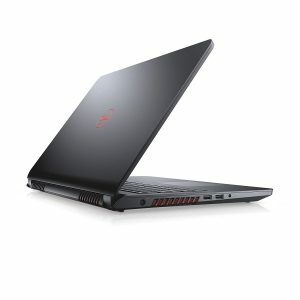 This is not a VR- Virtual Reality compatible gaming laptop, but still a great one with high-end specs and features that will let you handle whatever you throw at it. And this includes advanced gaming at high settings and resolutions and more than acceptable frame rates per second. The GTX 1050 graphics card has the dedicated memory of 4GB GDDR5 N17P-G0 and a video card benchmark score of 4636 as a high-end GPU. You’ll hear great quality sound through the stereo speakers, the subwoofer, and the MaxxAudio Pro. There is no Optical Drive on this model with thin chassis, but 3 x USB 3.0 ports (two with PowerShare), an SD/MMC Media Card Reader, RJ45 10/100/1000 Ethernet, 802.11ac wireless, Bluetooth 4.2 (dual band 2.4 and 5Ghz), an HDMI output, a Headphone and a Kensington Security Lock. It stays cool and runs quietly thanks to the very efficient large vents with 186 thermal fins, three exhausts, and two cooling fans and your games will not be interrupted and your palms will stay cool. Intel i7-770HQ processor with Kaby Lake H architecture has the Passmark benchmark score of 8975 at the time of this review. Thermal Design Power is 45 watts by default but you will get a decent battery life from its 6-cell 74Whr lithium ion battery, as this is a good gaming machine with FHD screen after all. The TDP can be reduced to 35 watts but the performance will be reduced as well. It can be used for both work and entertainment purposes as you can perform all your work and play games fluently.